The Claddagh ring has a distinctive design of two hands holding a heart topped by a crown. With these components representing friendship, love, and loyalty, the Claddagh is widely used as a friendship, engagement, or wedding ring. Its origins are Irish, but it is now worn the world over. Claddagh is a fishing village outside of the city of Galway, Ireland. The Claddagh ring has long been associated with this region. Its design is believed to go back about 300 years. While the exact origin of the Claddagh ring may be lost in the historic mists of Ireland, there are a host of legends and tales surrounding it. The one most widely accepted as true, however, is a very romantic one of enduring love. The story is of Richard Joyce, an Irishman from the Claddagh area, who was deeply in love with his lover. Somehow he was taken captive and brought to Northern Africa. There, he worked for a goldsmith who taught him that trade. Throughout his captivity, he longed for his beloved back home. He designed the Claddagh ring with its elements representing their deep friendship, their enduring love, and their lasting loyalty and forged the ring from gold. He kept it in the hope of someday being able to give it to her. After a number of years in captivity, Richard Joyce was freed in 1689 when William III came to the throne of England and made a treaty with his captors. The goldsmith he worked for thought so highly of him and his work that he offered him his daughter’s hand in marriage along with half of his own wealth if Joyce would remain in Africa. Joyce declined the offer. His only thought was to go back to Ireland to his lover, though he had no way of knowing if she was still there or had waited for him. The story does indeed have a happy ending. His love had remained true to him and had never married. Richard Joyce and his beloved were reunited and married. The story goes that they lived a long and happy life together. The Claddagh ring became a symbol of their abiding love. With its deeply romantic history, the Claddagh makes a perfect unique engagement ring. Given its Irish origins, it has particular meaning for anyone of Irish heritage. However, its symbolism makes it meaningful for couples the world over. Claddagh design of the two hands of friendship gently holding a giving heart of love crowned by a symbol of loyalty? It is the ultimate expression of love. While the original Claddagh ring was said to be forged from gold, Claddaghs are now routinely made from any precious metal. As Claddaghs have gained in popularity as engagement rings, gemstones have sometimes been added to the design. A stone can be placed within the heart. Smaller stones can bedeck the crown or be added to the sides. Today, a Claddagh engagement ring can be found in an assortment of metals with or without a variety of stones. If a stone is chosen, a diamond, the traditional symbol of endurance, is, as with other engagement rings, a very popular choice. Given the ring’s Irish roots, a green emerald is also common. For a personal touch, a birthstone can be used. If looking for a unique engagement ring, the Claddagh is definitely a good choice, especially once the couple has been told the story of its origins and symbolism. Though a Claddagh ring is widely used as an engagement ring, it is also used as a friendship or wedding ring, or just a ring worn for its beauty or cultural significance. So, a special way of wearing the Claddagh has evolved to signal to the world what it means to the wearer. A Claddagh worn on the right hand with the point of the heart facing outward means no one has yet captured the heart of the wearer. The point of the heart facing inward means the wearer is in a romantic relationship. A Claddagh engagement ring is worn on the left hand with the point of the heart facing outward. 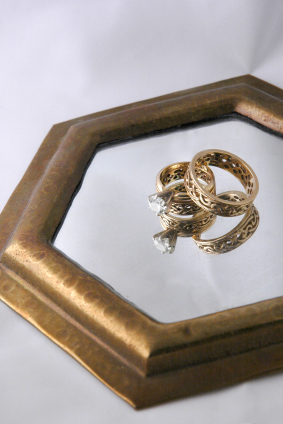 When the marriage takes place, the Claddagh is turned and worn with the heart pointing inward. As lovely and as unique as the Claddagh engagement ring is, it can be an exceptionally economical option. Already so imbued with loving symbolism, it can be an absolutely appropriate choice as an engagement ring in its original form without a gemstone. In sterling silver, a delicate Claddagh can be found for as little as $25. In 14K gold, the price climbs to the $100 range. Larger or more detailed Claddagh rings cost more. If a stone is added, the price is also higher depending on the type and size of the stone. Some birthstones are more economical than diamonds and add another layer of personalization and symbolism to the ring. As with all engagement rings, the type and weight of the chosen metal and stone govern the price. Claddagh rings are widely available in most jewelry stores as well as online. Claddaghs made in Ireland should have a hallmark stamp with the year it was made and guaranteeing the purity of the metal. Claddagh wedding rings and Claddagh wedding sets, including both engagement and wedding rings, are also available. Jewelers can advise on sizing and even provide templates to decide on a comfortable size. Online outlets have their own tips on sizing. It should be noted that there is a difference between American and International ring sizes so care should be taken to make sure which system is being used. Because the Claddagh is a non-traditional choice of engagement ring, it should be chosen with care. Make sure that the bride-to-be is open to a unique type of engagement ring. If she is, however, the romantic story of the origins of the Claddagh and the meaningful elements of its design make it a perfect choice as an engagement ring and a token of enduring love.